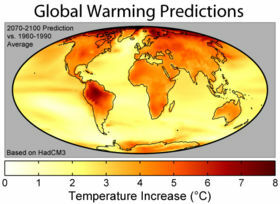 Global warming refers to the increase in the average temperature of the Earth’s near-surface air and oceans in recent decades and its projected continuation.Global warming refers to the increase in the average temperature of the Earth’s near-surface air and oceans in recent decades and its projected continuation. The geographic distribution of surface warming during the 21st century calculated by the HadCM3 climate model if a business as usual scenario is assumed for economic growth and greenhouse gas emissions. In this figure, the globally averaged warming corresponds to 3.0 Â°C (5.4 Â°F). Now, NEW Zealand scientists hope a newly discovered bacterium that eats methane could ultimately help counter a key global warming gas. The bacterium was discovered living about 30cm below the ground in the hot, acidic environment at Hells Gate in Rotorua, a geothermal area.